Konvertor FM is a modern, user-friendly file management tool that supports conversion between a wide array of image, audio, video and text file formats. The application’s neat interface lets you quickly switch between several tabs, each of them offering different settings profiles. The layout offers easy access to your locally stored files and folders so you can quickly select the ones you want to work with. Konvertor FM supports batch processing and includes built-in audio and video players but also text and image viewers. You can open multiple tabs at once and the image viewer lets you edit your photos with filters that change color, turn them into mosaic style pictures, apply neon effects with support for undo/redo. 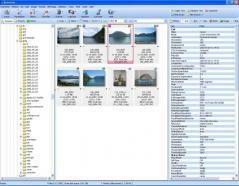 Items can be organized by name, size, file type, creation date and other parameters. The viewer has several modes – icons, list, tiles, thumbnails or jumbo. Images can be converted to PNG, GIF, BMP, PPM, TGA and TIFF. You can encode audio files to MP3, OGG, WAV, WMA, RA and many other formats. Videos can be converted to MKV, 3GP, SWF, MP4, MPW and VOB, while text files can be converted to RTF, DOC, PDF, XLS or WPS.